In early 2014 we had a fundraiser to build our own magnetometer. Amazingly within 12 hours of asking for help on our facebook page we met our target in donations (a little over 200 euros). Awesome people. We had to build everything from scratch so we knew it wouldn’t be easy, but quite frankly it turned into a nightmare build. There is really no “how to” on this sort of thing, we were really in the dark on a lot of things and it was a project fueled by a “hope for the best” attitude. Building it was the easy part. It took a few days to solder it all. Then it took a couple days to figure out how to attach cables to the sensors etc and how to put it all together. All nothing too serious up to that point. The difficulty came when we put it outside. The sensitivity of the magnetometer sensors is INSANE. Anything in the local area, even walking past with a screwdriver in your hand, they’ll pick it up. Any slight temperature change, they’ll register it as a geomagnetic storm. It took months of trial and error, many many redesigns, many burials/dig ups in different parts of the garden. Many problems with moisture, interference, cable problems, connector problems, wiring problems. It was the stuff of nightmares, chasing gremlins all over the place, many times not sure where they were exactly. I documented it all in great detail here, so if you want to build a magnetometer, you should see many aspects where I messed up and avoid them. So this page I will keep short and sweet and just show what now looks to be the finished article which looks reasonably close to commercial magnetometers located in observatories. 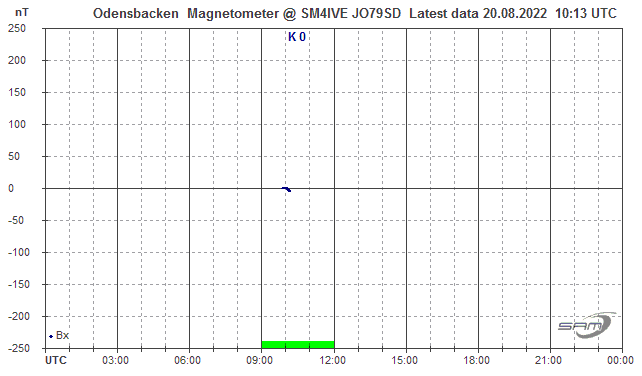 I will post some images from our magnetometer recordings to some commercial ones for comparison. So here is the final build. Ice drill works great for soil too! I decided to bury each magnetometer sensor individually in it’s own drain pipe. So I used the auger to drill a hole in the soil as far as it would go before it hit bedrock. I was hoping for a metre deep but it fell slightly short of this. But it seems deep enough. I got a drain pipe a little over 3 metres in length. I cut it down to 3 sections about 1.2 metres each. I got waterproof end plugs to plug the hole at the end that will be going in the ground. I done some sensor aligning and buried them in the ground. I made plastic covers/cable ties to keep the rain out. One thing I have found about this build is any sort of moisture sends the sensors crazy. So I don’t have to have long cable lengths (which introduce their own problems) I have an old laptop in a plastic tub that houses the magnetometer control unit and sends the data from that to our ftp server via wifi. 6. House the electonics in a seperate box. I have a strong suspicion the cables running into the back of the magnetometer control unit were picking up a little interference from power cables, so I have kept as much AC power stuff outside the white box as possible. There is a multiplug with ac plugs (and power adaptors) for the laptop and magnetometer control unit in there. I know there is not a great deal of pictures and or information, but if you read the old page, you will see how painful this build was so at the end I just wanted to get it finished as quick as possible. It has been running reasonable well for a week now. A new roof is being put on Aurora Service HQ which is taking 6 weeks, and there are builders and tools sometimes in the general area of the magnetometer, so there has been a little erroneous data sometimes. But for the most part, I am happy with the performance. Here are some comparisons from commercial magnetometer on a similar latitude a few hundred km’s east. When it comes to reading 3 axis magnetometers, the By component is the most important (for aurora chasers) and they match up really well (albeit the Nurmijarvi uses Z, D and H components. D is essentially By on our graph and H is Bx on our graph. EVERYONE who donated. The donations covered probably 75% the cost of this project, without which this project would never have gotten off the ground. Roger (GM4PMK) from http://www.marsport.org.uk/ who runs the same magnetometer and provided some very useful advice. Bill Speake from Speake sensors who manufacture the fgm-3 sensors who gave us some useful advice (especially it’s ok to solder the pins on the sensors). Dirk Langenbach and Karsten Hansky who provided the magnetometer kit and have provided some really great support since. Looks like the UK has more than a 3rd share in this project lol, great work by everyone. my sensor are down in ground 1.6 m .
the magnetometer could be seen here. just an encouraging post….. youre doing an amazing thing there and we are all rooting for you. Fascinating blog…. Most smartphones have a 3 axis compass/magnetometer and could be pressed into service as a portable magnetometer. There are some free apps on Android and I am sure the same is true for the Iphone.